The majority of pianos cannot be reliably dated purely on the basis of their serial numbers, and you only have to look at the listings here for Collard or Eavestaff to understand why. There is a widespread belief that numbers are the be-all-and-end-all for dating pianos, but the length of this page should indicate to you that it is not that simple, and I do not intend to perpetuate the myth by blindly repeating other people’s lists, although I have included some confirmed dates in the second section, further down this page. Don’t forget that if your computer has a keyboard, you can use the usual CTRL F to find a name on this page. Even if the name on your piano is a real maker, only a minority of piano makers have ever published dates of their serial numbers, and many of these are incorrect or misleading, so on this page, I have only included dates for which I have some evidence. Some are approximate years (marked ~) but from reliable sources such as the pianos themselves. In many of the items in our files, the American use of the hash sign or sharp (#) has been adopted (rather than the Italian "No.") to denote numbers, especially serial numbers: this is useful to know when a number looks like a year. Also, in order to make long numbers easier to read, several readers have asked me to insert commas after the thousands, although these do not appear on the pianos. A growing number of websites offer apparently simple dating of pianos by their serial numbers. Dating a piano in this way is notoriously unreliable, partly because so much misleading information has been published. These websites are often quoting from books which are incorrect, many of the date-ranges they give are very vague anyway, and they may expect you to PAY for this misinformation, so why not make a donation to us instead? Armed with over forty thousand images for reference, we can usually make a more objective assessment of the age from photos which show what the WHOLE piano looks like on the outside, unobscured by dogs, stools, vases etc.. These estimates are not distracted or misled by numbers or other information. If you open the top of a piano and look inside, you will often find one or more numbers in there, so don’t presume that you know which is the serial number, we can't always say what they all mean. Removable wooden parts of the case are often imprinted with a number, but this may only be the last 3 digits of the serial number, which is usually a long number, 5 or 6 digits. Remember that any handwritten information is probably not from the factory and could have been added at any time. Numbers preceded by a letter are not usually serial numbers. Sometimes, they are harder to see, and may be underneath a grand, so be aware of the dangers of crawling under there, and check that there is absolutely no movement in the leg joints before you do. If you slide out the music desk, you may find a number imprinted in it, or in the woodwork inside the top of the piano. Numbers cast into the iron frame are not specific to the individual piano, the frames are ordered in bulk, but a number painted on the frame may be the one. 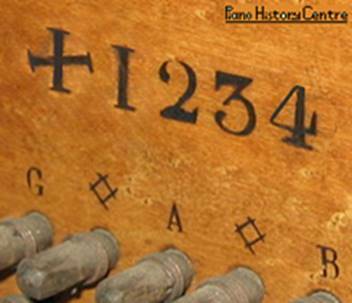 Most of the removable parts (such as the music desk) may be imprinted with the last 3 digits of the serial number, and this helps you to recognise the real number when you find it. If you are fit and healthy, you could crawl underneath and unscrew the pedal unit, but the number may be visible without doing that. 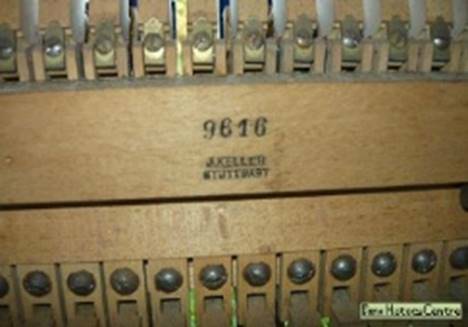 Some more modern serial number dates for British pianos of the 1900s are listed in date order near the bottom of this page, and by working backwards from a rough date, these may give you a clue to the maker of a piano which has no name. 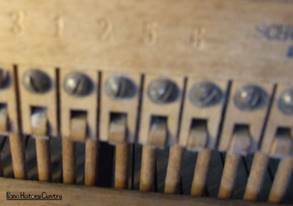 Date-marks inside the piano, if available, are often a much more accurate and reliable guide to the age of an instrument than numbers. Hallmarks for silver and porcelain, etc. are published widely in many books, but the same kind of information is not normally available for pianos, except on this website, and if there are no date-marks, serial numbers are one option, but there are many examples on the internet of dates of serial numbers blindly stated for pianos, based on incorrect information, with no cross-checking of anything else. The result is that an exact date will be stated as if it were fact, with no reference to whether the piano is of a type that could possibly have been made then. You may think of a year starting at January 1st, and Bechsteins’ published numbers logically show the last number in a calendar year, but this is not always true of serial number dates, for example Kemble numbers are from December to December, whereas Bentleys' are October to October. As explained on our date-marks page, it is pointless to attempt to date an antique piano to a precise day within a year, because the manufacturing process was often so long that we must be grateful just to know the year. When iron frames are made, in bulk, nobody knows which piano they will end up being used in, so any raised numbers cast into the iron are not specific to one piano, and not serial numbers, which would be painted if they appear on the iron frame. Numbers on keys or actions are not usually serial numbers, and not usually helpful. 1. THE PIANO MUST HAVE A NAME AND A NUMBER! Some of the enquiries we receive don't even give the name of the piano, just numbers: numbers are not usually any use without a name, but many piano names are meaningless. Sometimes, if you can send photos to show what the whole piano looks like, we can estimate the date, and the numbers may give a clue to the makers’ identity. If you are lucky, you may just open the top of the piano, and immediately see a number, but sometimes, the number is so well hidden that you may not find it. (If you do find just one, don't assume that it is necessarily the right one.) Patent numbers and registered design numbers can be researched through official channels, but are often a lot of trouble and expense for very little result. 2. THE NUMBERS MUST BE PUBLISHED. Many are simply not available, although our files include many dates of individual numbers which are not published anywhere else. 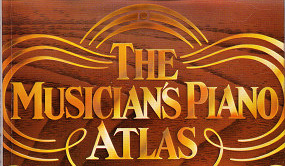 Books which give number dates are known as "Piano Atlases" after the original - Michel's Piano Atlas, which later became the Pierce Piano Atlas. Others include the Musicians' Piano Atlas, for which I supplied amendments, and an appendix with action and key numbers, although that information has been updated and improved in this page. Sometimes, in an antique piano, the action makers’ name and number is the only clue to its identity, and the best guide to its date. Names listed in the Europe Piano Atlas include Acrosonic, Aeolian, Albert, Allison, Anelli, Angelestein, Angerhofer, Apollo, Arnold, Arirang, Aristocrat, Atlas, Bach, Bachmann, Baldur, Baldwin, Bathur, Barratt & Robinson, Baumbach, Baumgardt, Bechstein, Bentley, Berdux, Berger, Berry, Bieger, Biese, Billberg, Bluthner, Bosendorfer, Bord, Breitkopf & Hartel, Brinkmann & Goebel, Brinsmead, Bristol, Broadwood, Brother, Burgasser, Burger & Jacobi, Fibiger, Cuawberghe, Challen, Chassaigne, Chappell, Choiseul, Christensen, Chu-Seng, Collard, Conover, Cramer, Danemann, Dietmann, Markennamen, Dohnert, Doina, Dorner, Donath, Duck, Duysen, Eavestaff, Ecke, Ehrbar, Eisenberg, Ekstrom, Elcke, Erard, Estey, Euterpe, Fazer, Feurich, Fibich, Finger, Forster, French, Fuchs, Furstein, Gaveau, Gerbstadt, Geyer, Giles, Gillot-Straube, Gors & Kallmann, Goetze, Grand, Grotrian, Guckel, Gulbransen, Gunther, Gustaffson, Haegele, Habn, Hain, Hals, Hamburger, Hamilton, Hanlet, Harwood, Hautrive, Hellas, Heintzmann, Heppel, Herrmann, Herz, Horugel, Hofberg, Hoffmann, Hofmann, Hofmann & Czerny, Hofmann & Kuhne, Hopkinson, Hornung & Muller, Howard, Hupfeld, Ibach, Inbal, etc..
3. THE PUBLISHED NUMBERS MUST BE CORRECT! In 1958, 5 years before I became so heavily involved with pianos, N.E. Michel published the first "Piano Atlas" of serial numbers: This work was a tremendous achievement, listing thousands of American and other names, but it’s a bit like train-spotting, many entries say no more than can be found written on the piano anyway, and quite apart from the appalling spelling, conflicting entries, duplicated misspelt entries, and the absence of proper cross-reference, an increasing number of the items he published have proved to be wrong or misleading, and this discredits the others. In the seventies, I wrote to his successor Bob Pierce about this matter, giving specific proof of inaccuracies, but he did not act on the information. Many numbers do not correspond to the instruments, including some of those for Aeolian, Allison, Aucher, Bauer, Bentley, Bluthner, Bord, Brinsmead, Broadwood, Cadby, Cecilian, Chappell, Clementi, Collard, Eavestaff, Erard, Euterpe, Gors & Kallmann, Hopkinson, Jarrett & Goudge, Karn, Kirkman, Knauss, Koch & Korselt, Kuhse, Monington & Weston, Murdoch, Nelson, Nunns, Perkins, Pleyel, Ritmuller, Rordorf, Spencer, Schiedmayer, Schroder, Spencer, Steck, Stodart, Tolkien, Wieck, Winter and Wornum. Pierce described his book as the bible of the piano industry, but “It ain’t necessarily so”! Neither do the little Bristol Miniature pianos, which he wrongly attributed to Duck, Son & Pinker. I used to tune one of these for an old lady until, unable to sell it, she stored it in the loft, where it probably fell to bits rather quickly! We are still puzzling over the connections between Bristol, KK, K.Kawai, LHH, Princess Piano and some similar but un-named examples from around the twenties and thirties. KK could mean K.Kawai, but Kabushiki Kaisha is apparently a general term for a company, a bit like a Japanese version of our “Ltd.”, yet it sometimes appears on its own as if it were a brand name. To add to the numbers mystery, by 1979, the electronics firm Sharp Kabushiki Kaisha’s modern American patent for an electronic device bears the same number 101957 as KK’s old piano patent. Bentley numbers start from 1919, and the name was mentioned in Booth & Brooks’ archives for 1903, yet the Bentley name was apparently not used by the Stroud Piano Co. until 1930, so we don’t know who made them before. Several sources have assumed that this was a made-up name, perhaps leaning on the prestige of Bentley cars, but it seems likely that they bought the rights from someone else. Perkins' numbers seem to be estimated, and are not supported by our information. These and other mistakes have been perpetuated by other books and websites reprinting them without evidence to support the information, but then it is a difficult trap to avoid, and everyone quotes published information sometimes, taking it on trust. Julian Dyer says "The numbers generally quoted for Steck pianos are highly misleading, at least for the European production. They clearly make no sense, and do not allow for the fact that these pianos were made in three different countries using three different sets of numbers". Some, like a 1906 example we saw recently, do seem about right, but the published numbers might suggest 1930 in what looks more like a 1920 piano, and a Steck dated 1926 has a number suggesting 1930. WHICH IS THE CORRECT NUMBER? Some people solve this problem simply by choosing the number which suits their purpose, or makes the piano oldest. In discussing the way that numbers are marked in a piano, it is best to avoid the word "stamped", because there are two different kinds of stamp. Ink marks can be made by a rubber-stamp, and these are often found on the sides of keys. Metal stamps have traditionally been used to IMPRINT names and especially numbers into woodwork, although they may be coloured as well. or engraved, but hammered, like some of my friends. Often, the serial number may be imprinted into the wood of the casework, sometimes conveniently located on the top edge, but this is by no means reliable, and grand case numbers are often harder to find, being hidden on removable parts, or underneath: Remember, too, the dangers for you, your children and pets, of crawling underneath a grand: Check that the legs are safe first, with no movement whatsoever in the joints. It's worth mentioning that the capital letter "I" may sometimes be used to double as a number one. Occasionally, two are superimposed at right-angles, serving as an asterisk, to confirm that this is the serial number. Metal stamps may also be pre-formed into the name of a senior worker, such as a supervisor who is responsible for quality control in a particular department of a factory. James Stewart's name, for example, was imprinted in some Clementi or Collard pianos while he worked for the firm, from 1826 to 1852, so such imprints can sometimes be useful guides to date. Wooden top bridges are sometimes imprinted too. Pianos were known in the factories as "cases", and they had CASE NUMBERS. The piano model might be standard, but the individual case can have minor differences and fittings, so by the late 1800s, removable case parts such as legs, music desks, etc. were often imprinted with the last 3 digits of the case number, so that the parts of the case could be kept together during manufacture, and this helps to confirm which is the case number. Steinways used very small stamps so that they could mark even the tiniest pieces of moulding in this way. Having said all that, case numbers are not necessarily the published serial numbers, which may be imprinted on the soundboard, or painted onto the iron frame. A problem that occurs with Collard & Collard is that although the case number is sometimes confirmed by being repeated in several places, it is not the published serial number. Some makers, such as Bechstein, Broadwood, Collard, Tomkison and Wornum, had separate numbers for different models, as well as a main series, and odd things can happen. Numbers for most makers will go through a period when they are in four figures, and may resemble a year, for example, in 1791, Broadwood square pianos had serial numbers in the 1700s and 1800s. In 1789-1790, Erard numbers also resembled years, and around that time, Southwell’s numbers, displayed on the front of the piano, were slightly earlier than their years. Windus numbers were in the 1880 range during the 1860s. It is important to realise that pianos made after about 1810 are hardly ever marked with a straightforward year of manufacture, and if a year is written on a piano, it will often represent the date the firm was established, or the date of an exhibition medal. A notable exception is Erard, who marked the years on the actions of the London pianos, or the soundboards of the Paris pianos. Pape marked the year under the strings but some, like one of ours, have unfortunately faded. It probably didn’t occur to the makers that anyone would be looking at them two hundred years later. 1792 John Broadwood square piano in the Mobbs Collection, Bristol, has the number 1931. Circa 1805 Thomas Tomkison, London, square piano #1965 in the Smithsonian. 1833 John Broadwood & Son upright piano #1778 in the Mobbs Collection, Bristol. 1931? Dagmar piano #85,425, keys marked 1931, James Smith & Son, sole agents, 76/72 Lord Street Liverpool. Also marked JS&S September 1947, so perhaps 1931 is a just number? reliably by Malcolm action numbers, in spite of the mark 2.10.9 on the iron frames. 1931 Monington & Weston Piano #50,347 has 2.12.9 on the frame, a very similar mark to the example above. It also has a number on a bracing #15,502. It might seem logical that serial numbers should, by their very definition, run in a single, unbroken series starting from the first piano a company makes, and therefore represent the number of pianos that have been made up to any given point in the list. Steinweg, for example, made 482 pianos before he emigrated to New York, and these were numbered from 1 to 482, so his New York “Steinway” pianos started at 483. Jay Mallory’s research in the Erard archives has shown that each new Paris piano had the next number. However, the same is not always true of their London pianos, or of Pleyel, and although several authors have estimated production figures for various firms on the basis of serial numbers, it is often not that simple: around 1898 for example, Squires were producing pianos with numbers in the 18,000 and 28,000 ranges. Some makers would (like Steinweg) start from a good, honest #1, and number every piano as they went, but some preferred to start at a much more generous figure. H.P. Nelson's company was established in Chicago, 1908, and started their serial numbers at 6000, but the published lists are confused, and dates are duplicated, some are out of sequence, and some have digits missing. Around 1910, Murdochs' ad boasted "fifty thousand pianos in use" and perhaps Spencer, whom they took over, had made that many, but it is quite likely that the statement was just based on their serial numbers. Another point worth remembering is that because some conventions in numbering developed gradually over a period of many years, they are less applicable to early instruments. Certainly, some firms opted for allotting a thousand numbers per year, even if their production figures were nowhere near that many. Indeed, it may have been based on the assumption that they would never need any more than that. This convention can be seen in many lists of serial numbers, but in view of the fact that some of these were originally published in Michel's Piano Atlas, I thought for a while that they might be Michel's own estimates, until other examples began to appear in our files from quite independent sources, such as the pianos themselves. An interesting angle here is to see how few pianos whose numbers go up in thousands have a high number of hundreds on the end. Strip away the thousands, and you'll find relatively few which have a remainder over five hundred, perhaps a glimpse of the real output. Ernst Kaps also used a thousand per year. Pleyel numbers went through a period of being a thousand per year. Witton, Witton & Co. were said to be producing a thousand pianos per year in 1915, but this may well be based on serial numbers. LePetit's pianos are numbered at a thousand per year from 1940, but this is unlikely to represent real production. By 1946, Welmar numbers were the same. Eavestaffs' first back-action minipiano was made by Brasted in 1934. Their serial numbers, again, may have been based on a thousand per year from 1934, rather than the main sequences of Eavestaff or Brasted numbers. Strangely, a Piano Times article on Chappells says their piano production had risen to one hundred per week (5,200 per year) by 1922, yet in that period, the serial numbers still only went up by a thousand per year! Warranty labels show that Chappells' separate "Elysian” numbers also went up a thousand per year, and these used date codes within the serial numbers, by placing the last 2 digits of the year at the beginning of the number, so #23,000 means 1923. The labels also carry a lower number with the same last 3 digits. By 1928, Marshall & Rose serial numbers were counted in steps of a thousand per year, with the first 2 digits also representing the year, so #28,000 would be 1928, like the Elysian numbers. It is possible that Steinberg Berlin numbers also worked like this. From 1946, Welmar also used numbers in which the first 2 digits represented the year. Ajello (the Manchester one) on the other hand, placed the two digits of the year at the other end, which has a peculiar effect on the sequence of numbers: If these were rounded down, they would give no clue to the date. Retailers’ stock numbers often add to the general confusion, and unless they are preceded by the dealer's initials, it is difficult to know what they are. For example “R&D” in the picture means that the piano was sold by Rushworth & Dreaper. “C&S” means Crane & Sons, they were unable to help us with archive material, and although their premises were said to include “factories”, we have been told by various trades people that they did not make the pianos, and certainly some were made by Kennard, Harold, or Cremona, so serial numbers do not help. Their stock numbers for new and secondhand pianos that they sold are preceded by “C&S”, and may give us clues to the approximate date of sale: some are listed further down this page. These are not to be confused with a C&S mark in a triangle on iron frames. “W&G” means Waring & Gillow, although if you search for it on the internet, you will get an endless list of items about TV’s “Will & Grace”. (“&S” usually means “and son”, and “&C” is “and Co”. “L” on the end may mean ”Ltd.”.) Sometimes, numbers are preceded by a letter or letters representing the branch, such as "MP" for Manor Park, or (more commonly) "HO" for Head Office. The letter P (for piano) may also appear in the case of a firm which sold other goods as well. We have some individual dates of stock numbers on file, as well as a few lists, and although these are incomplete, they are often useful. Harrods used metal or plastic plates with stock numbers preceded by the initial H, and they kindly gave us some dates for these. Model numbers rarely exceed 3 digits, whereas serial numbers are usually much bigger. Many makers use model numbers, and these may tell us several things about the piano: German firms like Bechstein and Grotrian used the size of the piano in centimetres - the length of a grand, or the height of an upright. Bentleys used the number of notes, so a “Concord 88” had 88 notes. Berrys did a similar thing with the number of octaves, and followed it with two digits of the year it was introduced, so the Berry 758 was a 7-octave model introduced in 1958. Collard & Collard pianos usually have a smaller number, thought to be the model, as do Spencer and Murdoch. Keys are almost always numbered left to right, and they also have their own numbers, which would have meant something to someone at the time, although very little of this information survives. It is not usually possibly to trace the history of an individual piano, but we sometimes have more information than the makers themselves, and we may be able to provide a useful cross-reference by looking up action and key numbers, frame markings, or historical data such as name changes, dates of addresses, etc.. Action makers’ numbers progress much more rapidly than piano numbers, because they sold actions to a number of piano factories. 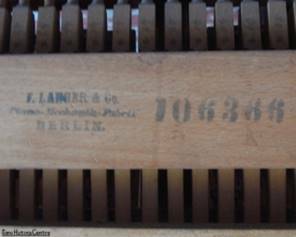 SERIAL NUMBERS FOR PIANOS, ACTION MAKERS, &c.
As well as pianos. the following alphabetical list includes approximate dates for the serial numbers of various action makers, which are often useful when the piano name has disappeared, or especially when no dates are available for the piano’s own number. However, I only list the small minority of numbers that I have been able to confirm or estimate. Up to 1914, it was common to import cheap German actions for London pianos, and even if the action makers’ name is not there, the numbers may suggest possible dates. See also the modern numbers nearer the bottom of the page. Now that so many people are viewing these lists of numbers on iPhones and small tablets, I am experimenting to try to find a layout that is not destroyed when the screen is very small. 1878 #19,000 is a confirmed date, but disagrees with the others! Be wary of what you read on the internet about Aucher dates. I should perhaps mention that “Freres” means brothers, it is not a name. The following list of Aucher Freres numbers (on your left) was given to me some years ago by the late John Davis. His occasional snippets of piano history were sometimes questionable, but combining this set with my own estimates of individual Aucher pianos, (on the right) they do line up quite well in most cases, and seem to be a great improvement on the previous published lists, which are nonsense. Goodness knows where John got these! 1820 - Not making pianos yet, in spite of the published numbers. 1845 # 1? - the year the firm was established. 1916 # 4,552 - according to Begg's stock records. If this really is the main number, it may be that production had been taken over by another factory. My own estimates seem illogical, bearing in mind that some of the pianos appear to be almost identical, but we have evidence that Bord's pianos were up to 6 years out of sequence leaving the factory, so perhaps Aucher's were too. Many examples are marked “Modēle No.1” even though they are not the same design. I would be grateful if anyone out there can provide real, hard evidence about genuine, definite dates of Aucher numbers, such as actual dates inside the pianos, or documents of sale. The following list shows numbers for dated pianos made by the wholesalers, Bansall. They supplied pianos for the trade, including Barnes, Binns, Caldecourt, Hopkinson Successors Ltd., Moore & Moore, Russell & Russell Ltd., and possibly Sames and Watson, our 1906 example is unsual in bearing the Bansall name, but they rarely displayed their own name, most were bought in by various retailers, who put fictitious names on them. The most likely way to identify one is by a label under the keys of the bottom notes, as shown above. The keys were often made by Shenstone, order numbers do not help us, they are not piano numbers. Some of their actions were made by Langer, and can be dated by the list down the page. Our Bansall piano #41373 is thought to be from 1906. Beware of the Bechsteins of the 1890s, with extra numbers that seem to imply a date in the 1850s. Bechsteins' belly numbers run in separate sequences for uprights and grands, and exist in addition to the main series. They can be found on the edge of the soundboard (as shown) and underneath. Here are a few examples, very useful if the main number is faded, or painted over. Can anyone help us with more of these? 1880 Not listed in London directory. 1884 L.Blankenstein & Co., 25 Red Cross street, Barbican EC. 1886 L.Blankenstein, 62, Finsbury Pavement EC. 1899 L. Blankenstein & Co. had a branch at 44 Windsor Road, Penarth. 1913 - "Over 30,000 sold" - The Cabinet Maker magazine. Because there are three sets, these later numbers can easily be confused with earlier ones, but the middle column seems to be the makers’ own idea of the proper serial number. If you see what looks like a number LE1P216 in a piano, it is probably a word - LEIPZIG! Bluthners, of Leipzig said "Our records were destroyed during the last war". James Reeder confirmed this in 2004: "Dear Bill, All records were destroyed during World War II, as well as the factory and offices, so there are no production records available." The following estimates are my own, worked out by me on the basis of pianos I know of, so if you find these same numbers on the internet, accredited to someone else, they got them from me. My estimates of individual pianos turned out to be so close to a thousand per year, I rounded them up. 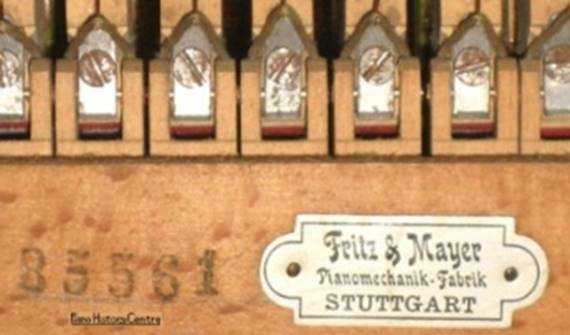 1856 Patent for an action (mechanik) is mentioned on some pianos, which must therefore have been made after 1855. 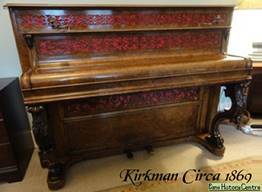 1860~ #678 owned by Chester Stegman mentions the 1856 patent, but does not mention the 1865 medal, so the mean date for this piano is “circa 1860”. which continue for a while at 1000 per year. Then, production appears to have increased to a point where a thousand numbers per year was not sufficient, so the makers allowed 1,500. Some pianos have two numbers, for example #18,187 also has #20,939. Bord’s pianos were cheap and mass-produced, in fact he laid down many of the principles that came to be used in other trades for production lines. However, these are surprisingly good, durable pianos, with Schwander actions, and reasonable wrestplanks. Published dates of their numbers are not always reliable, especially pre-1870, but the original stock records of Rudall, Carte & Co. are a useful source of serial number dates: Robert Bigio very kindly supplied this information for the period from about 1870 to 1876, and I have ploughed through it in search of Bord's numbers. The following pianos are listed here in number order, with dates of sale, not manufacture, and they don't run in order: it is evident that pianos didn't come out of the factory in order, and may also have been in stock at the shops for up to four years. In most instances, the purchase price is also given. The numbers range from to 18723 to 27414, and were sold between 1871 and 1875. This information shows that numbers in the 18,000 range were still being sent out to shops in 1871, and some were sold as late as 1875. That represents about 3,000 per year, which lines up roughly with their ads stating that they were making 12 pianos a day. In 1900, they announced their hundred-thousandth piano. By 1926, they were saying they had made 132,000 pianos, yet their published serial numbers were only increasing by 500 per year at the time. Some can also be dated by their Schwander action numbers, but those numbers are not so easy to find, being on the back of the action, so it is safer to ask your tuner to look. In music, the "Three Bs" are Bach, Beethoven & Brahms. In the piano trade generally, the "Three Bs" are Bechstein, Blüthner & Bosendorfer, except in London, where they are Barnes, Berry & Boyd, three large firms who had many shops around London in the 1900s. Surprisingly, Bansall, Brasted, Barratt & Robinson and even Broadwood and Brinsmead didn't get a look in, although Bechstein, Broadwood & Blüthner were a popular trio of names in some old dealers' ads. 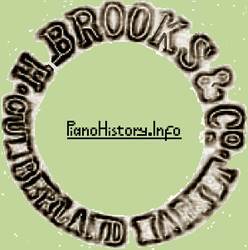 I used to work for Berrys, and have tuned so many Barnes, Berry and Boyd pianos over the years that it would seem pointless to put all the details on this page, but specific enquiries are welcomed. Boyd pianos were not all made by Boyd, and dating them purely by serial numbers is not reliable, no complete lists are published. 1921 #50,262 Boyd Coronet grand, different sequence – different factory? Harry Brasted established his factory in 1873, and by the early 1900s, Brasted Brothers were making pianos for the trade, rarely displaying their own name. I have tuned many Brasted pianos, but only a handful had the name Brasted on the front. Their iron frames are sometimes marked BB. The following list is partly estimated, and can be very useful if you find the Brasted name inside a piano. As with Bansall, the most likely place is a label under the keys. Some “Boyd” pianos were made by Brasted, and Harrods sold them as “Reger”. Other names include “Challen”, “Paul Gerard”, “Ehrmann”, “Emile Auberon”, and “Reun”. This list may also help with some Eavestaff models. See also the modern numbers near the bottom of this page, as well as notes on Brasteds near the bottom of our Archives page. No useful number sequences have been found in Brooks actions or keys, but there are some clues in the changes of name and address of the firm. The principal London action maker of the 1800s, they are said to have been established in 1810 by Henry Brooks, but this is incorrect, it was originally Cox Brooks, and we have no precise date for their start, perhaps around 1822. Cox Brooks & Sons were certainly in business between 1842 and 1845, but by 1841, they were also being listed as T.& H.Brooks, described as “Pianoforte Hammer Rail Makers” at the same address, Little Albany street north. They didn’t just make hammer rails, they made the whole action. The name T. & H. Brooks on an action suggests a date in the 1840s or 1850s or “circa 1849”. These Brooks Ltd. numbers are stamped into the damper rail, they do not run in sequence, they may be models or types. In 1920, They merged with Herrburger, Paris - see Herrburger Brooks. 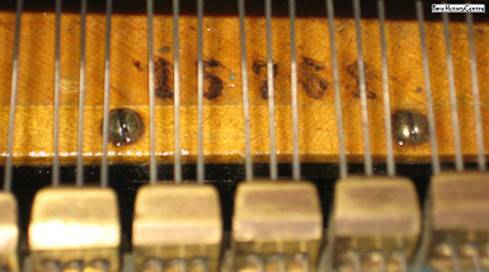 Looking inside the top of a Cadby piano, you might think you can just write down the number and look up the date. You have two main options here, either trusting the published dates of their numbers on the left, or trusting my estimates on the right, which sometimes do not agree. There may be more than one number, but the main one usually appears below the imprinted name C.CADBY, as shown above. 1862 onwards, the pianos should mention a medal they received at the 1862 London Exhibition. 1874-1877 The firm was known as Cadby & Sons and this name should appear on a piano of that period. George Sherborne was indicted at the Old Bailey for trading in pianos whilst he was bankrupt. His Cadby Rosewood Cottage pianos had numbers from 19,300 to 19,661 in 1878.
according to Chas. Begg’s stock records. 1878 onwards Challen & Son again. In the 1960s, the manufacture of Challen pianos was taken over by Brasted Brothers, of London, when they mainly made the 988 model. Published dates of these modern serial numbers vary, and are not reliable, but we have some dates found in the pianos, usually on the keys. Modern “Challen 1804” pianos are Chinese. See the modern numbers near the bottom of this page. Samuel Chappell was involved in the music business by 1810, but although they quote serial number dates from 1840, the company didn’t start making their own pianos until 1861. The main numbers for Chappell pianos are hard to find in some of their Victorian pianos, and their other numbers are misleading, quite apart from the Chappell Elysian numbers mentioned below. By 1870 the numbers are said to be 10,000, but the stock records of Rudall & Co. show that in 1870, Chappell serial numbers were around 71,730, apart from one with the quite different number 6,007, which should be 1860, according to the published numbers! Strangely, a Piano Times article on Chappells says their piano production had risen to one hundred per week (5,200 per year) by 1922, yet in that period, the serial numbers still only went up by a thousand per year! 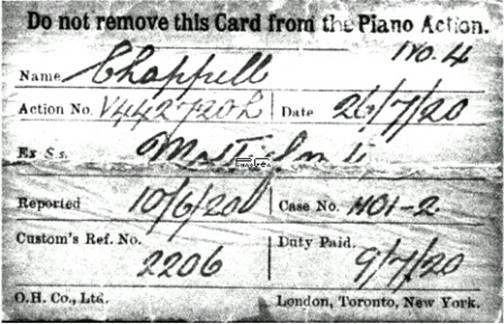 Some modern serial number dates for Chappell pianos are listed near the bottom of the page. Warranty labels show that Chappells' separate "Elysian” numbers also went up a thousand per year, and these used date codes within the serial numbers, by placing the last 2 digits of the year at the beginning of the number, so #23,000 means 1923. The labels also carry a lower number with the same last 3 digits. The serial numbers for Collard & Collard are without doubt the most confusing, but it seems that there is often a 3-digit number for the model, a 4-digiti number indicating the number of that type made so far, (dating all the way back to Longman & Broderip) and a 5-digit number which is the actual serial number. In the course of time, the 4-digit numbers became 5-digit, and the 5-digit numbers became 6-digit, so it can be very confusing if you only look at the numbers. The best approach is to estimate the age by its appearance before looking at the numbers, and I have the facilities to do this more accurately than most people, if you send photos which show the WHOLE piano, unobscured by dogs, stools, vases etc.. In 1972, I wrote to Collard & Collard Ltd. at an address which I knew to be that of Chappell & Co.. They were unable to help me with any information, having lost their archives in the 1964 fire, so they passed on my enquiry to the late Frank Holland at the Musical Museum. He followed his normal procedure, and PASSED IT ON TO ME to answer! (Good ol' Frank, bless 'im!) Many of the Clementi and Collard dates quoted by Michel are complete nonsense, and the 1832 paperwork shown below proves beyond doubt that the firm became known as Collard & Collard (late Clementi Collard & Collard) immediately after Clementi’s death in 1832. This proves that the dates given for later Clementi numbers are too late, and the early Collard numbers are too early. Michael O'Hara wrote from Arizona about an Edwardian upright with an elliptical name transfer “Clementi & Co.” but this is obviously not the original firm. After Clementi's factory fire in 1807, some of their various numbers seem to work out close to a thousand per year, a sequence which was continued for some years by Collard & Collard when they took over the firm. says that there was a sequence specifically for all square pianos made since 1796 by Longman & Broderip and successive names, and also a number for ALL pianos ever made by them. They place the numbers 2554 and 27943 at 1833. David Hackett says “There is a strong thread of continuity running through the pianos of Longman & Broderip, Clementi & Co., and Collard & Collard. This extends to the serial numbers, which can be found on most of the instruments. There are often two numbers. One is usually written in ink, and is part of the series covering the grand total of all the pianos made by the firms. The other is stamped, and is the number in the series of a particular type”. Back in the seventies, I came across this Collard square piano, which the owner bought with great intentions of restoring, but didn’t get around to. Being only the second square piano I had worked on, I bought it, and planned the same, but found it difficult to resolve problems with poor dampers that didn’t stop the strings sounding. My cousin, having done the wood finishing on it, became equally hooked, and he took it on with great plans, but eventually sold the job to someone else. It might seem that with a number 36196, it was made 36 years after the 1807 fire, so 1843. However, the initials suggest that it was still in the stock of Cramer Addison & Beale when they became Cramer, Beale & Chappell in 1845. It appears that they may have shortened their stock number from 36196 to 196, so although it could easily be an 1843 piano, the real serial number is probably 3241, which we can reasonably date to 1845. Incredibly, this one of the very few firm dates that are available worldwide for Collards’ early 4-digit numbers, but Alan Jones’ grand has a hand-written number 37414 which suggests 1844, a reasonable date for the piano, and the 4-digit number imprinted in the wood is 2675.
was made, and bears the name of Burling & Co. These estimates are based on the fact that #8945 is dated 1891, suggesting that they only used about 120 numbers per year. I am grateful to Damien Lightfoot, who sent details of his Collard & Collard Yacht piano, with the main number #8945 imprinted on the top edge of the case, along with smaller numbers elsewhere, 4435 and 675. I estimated that the piano was from around 1890, and he found the actual date 11/5/91 written on the side of the bottom key. Genuine Clementi pianos are before 1833, Collard & Collard pianos are after 1831. Circa 1828 is the mean date for a piano bearing the name “Clementi, Collard & Collard”, provided it is not “LATE Clementi”. Circa 1829 is the mean date for a Clementi which has James Stewart’s name inside. He joined the firm in 1826. 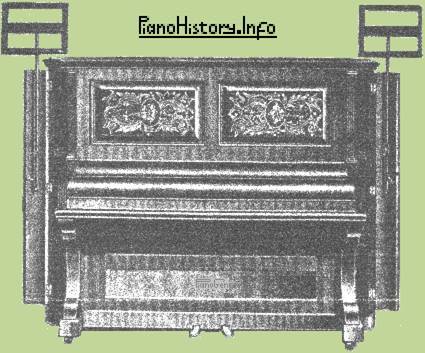 As explained on our Miscellaneous page, if a Collard piano of the mid-1800s does not have rounded sharps, it was probably made before 1856, so a rough estimate would be circa 1844. Rounded sharps were used by them from about 1856, but were phased out by about 1893. 6-digit numbers correspond to the published lists, and are clearly but untidily handwritten in a sloping manner, below what we believe to be a 3-digit model number imprinted in large, clear figures. Here is another set of numbers, hand-written ones. You will see that, although very useful, the sequence is not entirely faultless, it includes some estimated dates of pianos, and some question marks. These 6-digit serial numbers are sometimes more difficult to find, whereas the 5-digit case number may be repeated in several places on removable parts. Some modern serial number dates for Collard pianos are listed near the bottom of the page. The stock records of Rudall & Co. show that Collard pianos in the range 90,259 to 111,167 were sold in random order between 1871 and 1878. In addition, one was numbered 10487! The Cramer firm changed its name several times, and this helps us to estimate the date of some examples, as well as other makes sold by them. These include a Collard mentioned above, still in the stock of Cramer Addison & Beale when they became Cramer, Beale & Chappell in 1845. It appears that they may have shortened their stock number from 36196 to 196. 1858-9 1858 Cramer, Beale & Co.
1859-61 Cramer, Beale & Chappell. George Wood is said to have initiated their piano-making in the early 1860s, so it seems that earlier “Cramer” pianos were not made by them. 1861-3 Cramer, Beale & Wood – the London firm, dates differ from the Dublin shop. 1880 #15,000 first published number. 1885 Received a medal at the Inventions Exhibition. See also the modern numbers near the bottom of this page. If your piano is imprinted with a number preceded by the letters C&S, this indicates a stock number for the retailers Crane & Sons, and although they were unable to help us with archive information, the following list gives approximate dates of sale for some of these. Bear in mind that it may have been an earlier piano, sold secondhand. A marking C&S on the iron frame is not Crane & Sons. Cranes received a medal at the 1885 International Inventions Exhibition, which was mentioned on pianos for many years after. Dale Forty pianos cannot be reliably dated by numbers, because they were made at several different factories, and on some pictures from their own catalogues, the name Cramer is faintly visible. I suspect that (like many small firms) they only made uprights, and Cramer made their grands. Someone identified only as "PianoGuy" says that pianos sold at the Cheltenham shop have a paper label inside the top, with a number which is a code for the year, and the number of pianos sold up to that point. Pianos of the 1800s have the last two digits of the year, followed by 3 digits for the number sold that year so far. Some twentieth-century pianos have the last 3 digits of the year, followed by 3 digits for the number of pianos. These are more complex forms of thousand-per-year numbering. In the twenties, some of the Dale Forty numbers were in the 44,000 range. At some point, Rudd & Co. (London) became involved with Debain’s more famous firm, sharing their Paris address when they moved to Buttes Saint Chaumont, that strange area of Paris with the man-made mountains and caves. It seems possible that Rudd initiated piano making for Debain, or French Pianinos and Harmoniums produced with Rudd & Cie’s name on them may have been made by Debain. On this basis, we could estimate that our Rudd Pianino #5049 (kindly donated by Mr & Mrs Black) may have been made around 1854, and although I thought it would be later, it does not bear any reference to the medal they received at the Paris Exposition in 1855, so it was probably made before that event. 1855 #5,330 Debain's Harmonicorde, a combined upright piano and harmonium in The Bowes Museum. The stock records of Rudall & Co. show dates of sale, not manufacture, so they don't run in number order, and it appears that some Debain instruments were in stock at the factory for 2 or 3 years, then in stock with Rudall & Co. for up to five years. Some dates of sale start with the name of the month: others start with the number of the day. In most instances, the retail price is also given. These are very similar to Bord’s numbers. 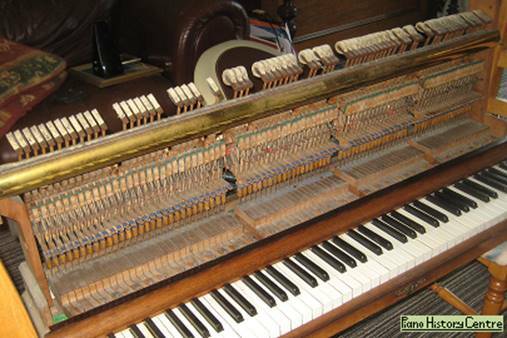 Piano #22,817 has been estimated at 1880, but the information above puts it nearer to 1872. It also has a number 15,619, suggesting a date around 1970! Later Debain pianos may be dated on the keys. Eavestaff moved from Great Russell Street to Berners Street in the late 1870s. Our first listing for that address is 1880. 1889~ The firm became "And Sons". Definitely by 1892. 1934 #60,700 date label 16/7/34 under keys. rough guide, and there are other numbers inside as well. 1936 #2,000 First known reference to Princess Ingrid on Eavestaff pianos. 1938 #4,000 References to Princess Ingrid & Princess Elizabeth. 1940 Eavestaff brought out a more conventional model which they called "Miniroyal"
1944 #10,000 References to Princess Ingrid, Princess Margaret & Princess Elizabeth. The Eavestaff Minroyal Model 90 was introduced. Information from the original archives of Erard and Pleyel shows that the published numbers are wrong in some periods. The Erard entries also make no allowance for the fact that instruments from their London factory bear a completely different sequence of numbers, and using the wrong set can cause you to be half a century out! These numbers are imprinted inside the London Erards. Back in the eighties, I was the first person in the world to publish these, although the list has been greatly improved since then. It has been suggested that these dates refer to the manufacture of the actions, and the piano might not have been completed for a further year or so. Nevertheless, these are definite, confirmed, accurate dates, completely different to the Paris lists. 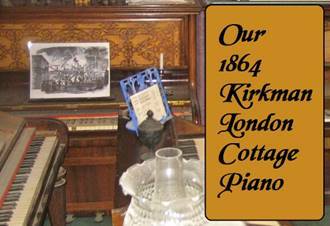 It is not clear why so many of their surviving London Cottage Pianos seem to be in the 1868 range. Numbers over twenty thousand may suggest a Paris piano. See also the bottom of our Archives Page. 1886~ # 2,380 C.Fritz action pre-dates the partnership with Mayer. Here, we can only use any references to exhibition medals to get an idea when the action was made, which will be after the last medal mentioned on the label. 1878 Gehrling received a Silver Medal at the Paris Exposition. 1880 Gehrling received a Gold Medal at the Melbourne Exhibition. 1885 Gehrling received a Grand Diplome D'Honneur at the Antwerp (Anvers) Exhibition. 1889 Gehrling received a Gold Medal at the Paris Exposition. Round about 1920, they became known as Gehrling & Douillet. 1904 #31,710 is dated on the keys. #24,306 is also said to be 1915! 1934 #68,750. Challen pianos were being made in London at the Brasted factory, with the “Gors & Kallmann” name on them, and numbers in the 120,000 range, which do not correspond to serial numbers for Gors & Kallmann, or Challen, or Brasted! I’m grateful to Rob Chapman for telling me about a 1936 key-frame label on “Gors & Kallmann” #120,593. Orginally Schwander’s firm, Herrburger was his son-in-law, and when he became a partner, his name was placed second – Schwander Herrburger. Later, he took over the firm, and it became Herrburger-Schwander. See also the Schwander numbers. No useful numbers have been found on Herrburger Brooks actions or keys, but Herrburger-Schwander (Paris) merged with Brooks (London) in 1920, so the name suggests a date after 1919. Initially, the name “Herrburger Brooks” was imprinted in the wood. By 1922, a black label was sometimes used on the back of the hammer rail in uprights. By 1926, a gold label was sometimes used on the front of the hammer rest rail. Some still just had the imprint. 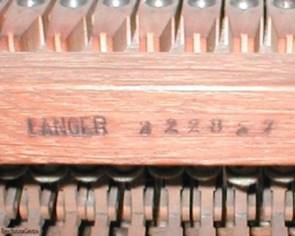 The action on a 1922 Chappell upright piano is clearly marked “Otto Ingel”, but the system of numbering is very similar - S35522L. Later, the Higel name was used by Gamble Piano Actions Ltd., also known as Gamble Player Actions Ltd., or simply GPA. William Howlett was one of the best-known piano names in East Anglia, where he claimed to be the only pianoforte maker, and also claimed to have been established at Norwich in 1820. By 1872, the company was known as Howlett & Sons, and later Howlett & Son. The serial numbers of Howlett pianos are not all in the same sequence, and this suggests that they were made by more than one factory, rather than all being made by Howlett. The following stock numbers imprinted next to the name are a better guide to date, but the dates are only estimated, and a piano sold secondhand would be older. When I used to commute across London in the sixties, I would pass the Triangle Works on Hackney Road, near the junction with Cambridge Heath Road. According to their pianos, Jarrett & Goudge were established in 1868, although some sources give the date as 1871. They do not appear in our many London directories until 1891, although there are references to Goudge on his own. Internet references to New Bond Street are incorrect, it was New Broad Street. In the eighties, The Musicians' Piano Atlas published revised entries for Jarrett & Goudge, based on nothing more than my vague comment that Michel's numbers were “about forty years out”. Bearing in mind that the following dates are my more recent estimates of individual pianos, achieved without reference to anything else, it is strange that they are almost exactly forty years later than Michel’s version. Their numbers don’t seem to run in any logical sequence, and are probably encoded. A number on the soundboard preceded by the letter K, near the left end of the keyboard, is probably a piano made by Kemble. It is sometimes difficult when a name is taken over by another factory, and the numbers can change. In the early 1900s for example, the “Cramer Agencies” had absorbed such old names as Brinsmead, Dale Forty, Dussek, Cavendish, George Russell, Metzler, Saville, and Justin Browne. Some, in turn, were later taken over by Kemble, and their numbers changed again. Kemble had absorbed the remnants and descendants of many great London names, such as Addison, Allison, Bates, Beale, Brinsmead, Browne, Chappell, Clementi, Collard, Cramer, Kirkman, Longman, Metzler, Squire, Wilkinson, Wornum, etc., and also made pianos for the trade under many different names, including Barnes, Bijou, Brinsmead, Chappell, Cramer, Dresdner, Firth, Higgins, Minx, Osbert, Regent, Renn, Rogers, Rogers Eungblut, Sebastian, Shenstone, Squire, and Stiles. Identical models may appear with many of these names. They only found out in recent years that they were established in 1911, and by 1921, their numbers were in the 13,000 range. By 1930, their serial numbers were preceded by a letter K, and normally located on the left in the interior, at keyboard level. I have no evidence to connect them with the much earlier firm of George Kemble. In 2009, the Kemble factory, which had been owned and supported by Yamaha for some years, finally closed down. Hackney Archives have some of Kembles’ archive information, but it may not be not catalogued yet. Some modern serial number dates for Kemble pianos are listed near the bottom of the page. By the 1920s, they had numbers suggesting the 1880s. We are asked to believe that only 790 of this famous name were made in 26 years – less than one per week. Here are some estimates. 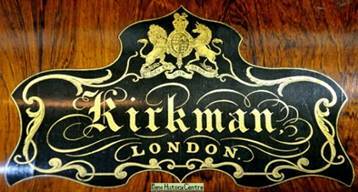 The impression from these is that they made an average of 1677 Kirkman pianos a year, or at least got through that many numbers from 1915 to 1937. The wartime numbers shown here in red are not in sequence. On average, the others get through about 15,000 numbers per year. 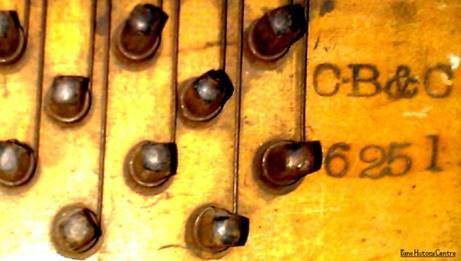 Our Bansall piano circa 1906 has an un-named German action with the number 246,603, probably Langer. Later taken over by Herrburger Brooks. Well-known as a maker of harmoniums, (we have a 1914 example #32315) Malcolm also made piano players, and piano actions, and these usually have a numbered label on the rear of the hammer rail. Several tuning customers commented that “you still have that cough” and I began to realise that I only coughed when I was working on pianos with Malcolm actions. I suppose I must be allergic to something in the felt dust. Monington & Weston pianos have separate belly numbers (soundboard numbers) in addition to the published serial numbers. See also the modern numbers near the bottom of the page. Some have adjustable brass flanges, as illustrated. Murdoch upright pianos typically have a number on the top edge of the bass end of the case, with a smaller number at right-angles, thought to be a model number or type, but the published numbers for Murdoch are unreliable, although they can often be dated quite reliably by the action number, if it is made by Malcolm. 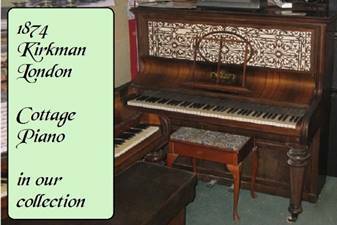 Many of the pianos had made-up names such as Claremont, Normelle or Rottmann. At some point, Murdoch took over the Spencer factory, but also used other factories, so Murdoch pianos cannot usually be dated by numbers. 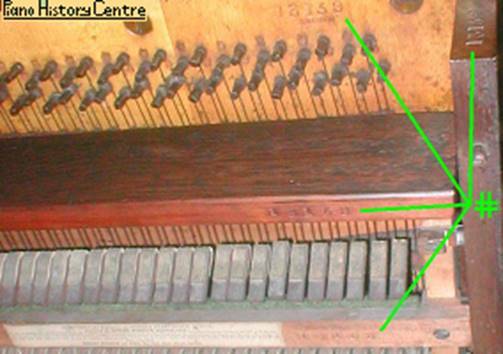 These pictures show that a Murdoch piano had the number 1647, and also 187 at right-angles to it, and 21647 further inside, in addition to 214A encircled on the iron frame. That one indicates a “scale number” - a design for the layout of the stringing, and not individual to that piano. 187 is thought to be a model number, and is no help to us, but we are left wondering whether the serial number is 1647 or the more likely, longer number 21647. It doesn’t really matter because we can’t reliably date Murdoch numbers anyway! In terms of names, there were ELEVEN different Schiedmayer firms, so before you apply any published information such as serial numbers to your piano, it is vital to check inside and outside for the full name of the company that made it. Sadly, various sources (especially on the internet) see the name "Schiedmayer" and immediately jump to the conclusion that it is some particular firm, without checking first. Other simply refer to “Schiedmayer” as if there was only one firm. JOHANN CRISTOFF SCHIEDMAYER made clavichords in the eighteenth century. ADAM SCHIEDMAYER made pianos in his own right. DAVID SCHIEDMAYER made pianos in his own right. JOHANN DAVID SCHIEDMAYER succeeded Balthasar, and was succeeded by Johan Lorenz Schiedmayer. DIEUDONNE & SCHIEDMAYER had a brief partnership from 1809 to 1825, involving Johann Lorenz Schiedmayer. J.L.SCHIEDMAYER began under his own name. SCHIEDMAYER & SOEHNE became one of the two main Schiedmayer firms in Stuttgart, when J.L. was joined by his sons Adolf & Hermann. Perhaps from 1845? ERWIN MULLER-SCHIEDMAYER was established at Wurburg in 1874. J.& P. SCHIEDMAYER was founded in 1853 by Johann's younger sons, Julius & Paul, and became the other main firm. SCHIEDMAYER PIANOFORTEFABRIK was a later name for the company formerly known as J.& P. Schiedmayer, perhaps from 1870? Their published numbers may appear to remain at a thousand per year from 1871 (#9000) to 1925, but the entries do not include every year, and anyway, the pianos have more than one number. According to various sources, modern pianos bearing the Schiedmayer name were made by Kemble UK, and more recently by Kawai, Japan. 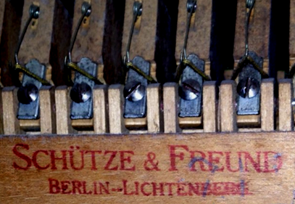 Schutze & Freund (literally “trade and friend”) were making piano actions from at least 1880 to 1928. Some actions were exported for use in English pianos, and some were used by German firms, including Baldur, Hauptmann, Waldstein, Musikhaus Ortlieb, Neumeyer, Steck, etc..
Around 1880-1910, they often made upright actions which were integral with the keyboard, so that they could be removed from the piano whilst still connected to each other, as they normally are in grands. (Henri Pape did this in the 1830s.) This can make repairs and adjustments in the home more difficult, and require 2 people, and a table of suitable height. Such actions are rarely seen now, I recently worked on this one dated 1904, but previously hadn’t seen one since the seventies. Isermann may have made them in that form too. A Schutze & Freund action with a number 31,256 is thought to date from about 1896, although this does not correspond to the following sequence. Apart from Henry Schwander, the family did not make pianos, but their name is often hidden inside, on the rear of the action. By the 1870s, Jean Schwander’s name was followed by that of his son-in-law Herrburger, who later took the lead. 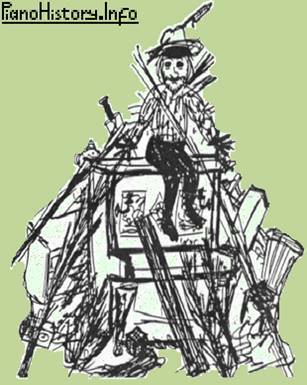 After 1878, some actions are marked with an imprint of their exhibition medals, as in the sketch above. Pianos that used Shenstone keys include Bansall, Brasted, C.W.S., Eavestaff, Kemble, Emile Auberon, Witton & Witton, Windsor, and of course John Shenstone & Co. Ltd., although we don’t think they actually made the pianos. Shenstone key labels are dated, but their numbers seem to have used some sort of code, they are not in sequence, so they do not help us with dates. In the thirties, Shenstone keys were normally used in conjunction with Herrburger Brooks actions. Sometimes, their iron frames are marked with JS and a number. I visited Shenstones’ TV shop in Leyton years ago, they had no archive material. We receive more enquiries about Spencer numbers than any others, and my entries on the Piano History Forum have had over twenty thousand hits for Spencer postings alone. Hundreds of their surviving instruments are listed in our files and, as with many old pianos, you can usually just open the top, and immediately see a serial number, often accompanied by a model number or letter. If you find the number 27673, it is not a serial number, it refers to a patent. Spencer & Co. were established in 1883, just getting started at a time when cottage pianos were going out of fashion, so they made very few of those, but the published dates of numbers for Spencer don’t begin until #25,000 in 1895, and the early ones seem to be wrong. According to the Pierce Piano Atlas, Spencer piano number 38,833 was made for HRH the Princes of Wales in 1905, but this is incorrect, her purchase was mentioned in Murdoch's Music Album celebrating the Coronation in 1902, and 1902 is also the likely date of the number. Strangely, it must also have been made or sold before #37,163, which has a plate inside it referring back to the royal purchase. Another aspect which adds to the confusion is that the titles such as “Duchess of York” or “Princess of Wales” are applied to different people at different times, and by 1894, the then Duchess of York had purchased a Spencer piano and said “What a fine tone it has”. What we do know for a fact is that by 1909, the numbers had reached 52,000, suggesting that in 26 years, they got through an average of two thousand numbers per year, although it is unlikely that they made that many pianos. Surprisingly, their numbers continued to increase at a similar rate through the 1914 war, then settled down to about one thousand per year. By the 1950s, some more modern pianos bearing the Spencer name have numbers that look like those of the 1880s. There is a lot of confusing and misleading information published about dates of numbers for “Steinberg”, partly because there were several separate firms using that name. As far as Steinberg Berlin is concerned, in spite of the sudden increase in the early twenties, this list is the best we can offer, compiled from a number of different sources. It seems that serial numbers may have been counted in steps of a thousand per year, with the first 2 digits also representing the year, so #28,000 might be 1928. The firm was established in 1908. 1965 #39,510 “Sole distributors Gilberts Pianos Ltd.” made by Rogers? 1973 #40,600 made by Kemble? The few available dates we have for Stodart (London) pianos all seem to be estimates, some are my own, some from owners, museums, restorers etc.. The numbers do not run in a single continuous sequence, so without photos of the WHOLE piano, we can't guess anything about the date. Some of the variations may be because of various members of the Stodart family producing pianos. The only published lists are for the later American firm, and some of those are misleading. 1876 #7,637 is imprinted 974 on a vertical post inside the bottom of the piano. 1878 #8,671 is imprinted 990 on a vertical post inside the bottom of the piano. 1890 #13,999, keys dated 5-15-90, also has 2508 inside. 1897 #16,006 is dated on the side of the bottom key. 1899 Henry Ward had moved to 44, Arlington road, Camden Town NW. 1911 He seems to have ceased trading, but the name continued to be used in the twenties. #43600 is thought to be about 1922. Numbers published for Wornum are misleading because they do not give the Piccolo Pianoforte numbers, or the grand numbers, and as more and more production was devoted to Piccolo Pianos, the numbers for these almost began to catch up with the main number sequence. Pianos bearing the Store Street address must be after 1830. In the main numbers, for example, #4,900 is dated 1837. Our Wornum & Sons piano, dated 1875, generously provides confirmation of the same number 13,159 in 4 different places, as shown above. By the 1890s, Henry Zender was producing pianos in London. 1896 Henry Zender & Co. Ltd. - Sole inventors and patentees of The Combined Piano, Music Cabinet (to hold 1,000 pieces of music) and Stand. 1923 His output included backless uprights sold as “W.H.Barnes”. This is a list of twentieth-century serial number dates, mainly from some of the pianos I have tuned over the years, which were reliably dated inside. Where several numbers are known for the year, I give the earliest and latest. It would be so easy for other tuners to keep such information on index cards or computer, and help us to preserve history. If you have an idea of the date, and the true maker is uncertain, you may be able to guess it from the numbers on this list. 1913 Waldberg #34,500 by Danemann? 1921 Kemble #13,800 Dated on a paper label on the back. Kemble #20,800 Dated on a paper label on the back. James Smith & Son #40,200, actual maker unknown. 1931 Amylette #7,300 by C.W.S. 1932 Barnes #36,400 by Kemble? 1934 Barnes #39,700 by Kemble? 1938 Amylette 10,400 by C.W.S. D’Almaine #51,500 & #51900 by Bentley? 1946 Eavestaff #5,400 – see main list. Welmar #46,000 Their numbers seem to start with 2 digits of the year. Paul Gerard #8,800 by Kemble? I would be pleased to hear from anyone who has dated any piano numbers by using the action number lists, or can date more action numbers for us. I find them a very accurate guide for antique pianos, but for more modern instruments, Barrie Heaton says "The problem with action numbers is that it all depends when the action was used: I remember talking to David Martin at Herrburgers about the single escapement action -"when did they stop supplying?" - he gave me a rough date, but then said that it was a good few years after that when manufacturers stopped using them as they had a back stock, and that was the case for all the common actions. - When I did part of my training at Bentleys, there was a big room full of actions and keyboards, and the action finishers would go in and grab the nearest one for that model, so they didn't run in sequence. However, having said that, I would be surprised if the action date was more than three years late.” Without donations, I will be fine, but our collection may not survive. If every visitor to this site made a donation, we could improve displays in our museum building, and also have much-improved facilities for research within our own archives.